Aaron Baker is the author of Mission Work, the winner of the 2007 Katharine Bakeless Nason Prize for poetry, selected by Stanley Plumly. 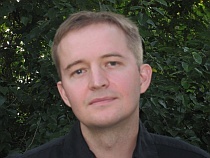 A former Wallace Stegner Fellow in Creative Writing at Stanford University, he received an MFA at the University of Virginia. He lives in Charlottesville, Virginia, with his wife, the poet Jennifer Chang. He teaches at Hollins University. Cecily Parks' Field Folly Snow was published earlier this year by the University of Georgia. 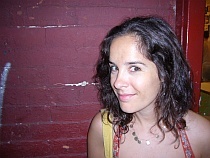 Her chapbook, Cold Work, won the 2005 Poetry Society of America New York Chapbook Fellowship. Her poems have appeared in a variety of publications, including Best New Poets 2007 and Tin House, and she has an essay in A Leaky Tent is a Piece of Paradise: Twenty Young Writers on Finding a Place in the Natural World. She is a PhD candidate in English at the CUNY Graduate Center. Aaron Baker: Congratulations on the publication of Field Folly Snow. I'm thrilled to have a chance to discuss it with you because it's such a terrific and unusual collection, and it interests me in all kinds of ways. Let me start off with a couple of observations. I know that although you now live in New York, you've also spent a lot of time in Wyoming--would it be fair to say that your time out west provides the inspiration for the majority of the poems in Field Folly Snow? The reason this intrigues me is that the settings of the poems, while important, seem to me less important ultimately than the sensibility behind them, and that it would be way too simplistic to peg them as "regional." Many of the poems take place either in literal wildernesses or places which border literally and figuratively on "the wild." I could see how some might call you a "nature poet," but do you think of yourself as a nature poet? Do you resist that label? Cecily Parks: Aaron, thank you for the congratulations. And thank you for your excellent questions. People who read my poems before meeting me are always surprised to find that I live in New York. I love this city, but my time out west certainly enables me to write the kinds of poems that appear in Field Folly Snow. I think you are right when you say that the poems’ settings are "less important ultimately than the sensibility behind them." Thank you for articulating that. I think my poems are an attempt to record the effects that the Western landscape has on my perception. For instance, in Wyoming I can sit on the porch and watch a rainstorm fifteen miles away slowly approach me. I can see the clouds and their curtains of rain in the distance, but I am in the sun, rocking in my rocking chair, waiting for the weather to change. That kind of perceptive experience forces me to configure my sense of my relationship to time and space. I am not sure that I consider myself a nature poet, but it is a handy way of classifying myself. I'd like to call myself an "environment poet," because I think the term "environment" is not necessarily limited to what is traditionally thought of as nature. Would you like to speak a little bit about the metaphysical aspects of environment, especially in regard to the environment of Papua New Guinea, where your poems are set? You have a gift for making the unfamiliar familiar and the familiar strange in your collection, Mission Work. It is a remarkable, and remarkably moving, book. I was particularly struck by the collection's radiant quality -- in your book, a childhood multiplies into childhoods, a memory into memories. I use the word radiant instead of fragmentary because I see these poems as generative rather than broken. Is that a fair assessment? AB: I like your descriptions of those Wyoming rainstorms. And when I read your poems, I really do feel like that I’m experiencing something about how perception works—how physical experiences open you up to different kinds of intellectual experiences. How something like a rainstorm isn’t just a rainstorm but a trigger for all kinds of surprising associations and internal events. I’ve heard writers talk about the difficulties of writing about “place,” even places that have affected them very deeply, while they’re still there in the midst of whatever experiences those places offer. Can you write about Wyoming while you’re still in Wyoming? For me, when I write about Papua New Guinea, I’m not only physically removed from the place but an adult looking back on the experiences of a child. So it’s really a double remove. Life in the Chimbu Highlands of Papua New Guinea at that time, while pigs were currency and the people fought wars with bows and arrows against neighboring clans, couldn’t be more different from what I was used to as an average American kid. The time period when I was there is also, I think, a pretty important factor in how I experienced the place and the people and how the people there experienced me. Understand that we were living with people in the remote Highlands who the outside world didn’t even know existed until the 1930s (and who themselves didn’t know until then that they weren’t the only people in the world). When we were there, contact with the outside had still been pretty minimal. And, obviously, my family and our reason for being there was a major point of contact. I don’t pretend to understand anything more than one small part of this sometimes bewildering and sometimes tragic story—both from the point of view of a child and as adult looking backwards. But at the same time, on some level, I still am that kid and I’m still experiencing that place. I do feel like I experienced a meshing between Christianity and the local beliefs in a natural world filled with and animated by spirits. Which is to say that I think I did and do think of those landscapes as haunted. As mysterious and beautiful but also pretty terrifying. I think that a lot or even most children probably experience something like this, whether they live in New Guinea, the American suburbs, or wherever. But I think it’s probably a lot more personal than what might be suggested by a term like “the metaphysical aspects of environment.” That’s something I don’t discount but which I think would be very hard (for me, anyway) to say much more about without descending into a lot of crazy-sounding mumbo jumbo! But when I stop and think about it, I don’t know if we’re on ground that’s any more solid when approaching the personal—we could also talk about the metaphysical aspects of memory and personality. I think that a major reason I’ve been attracted to poetry as a medium for approaching this material is that unlike memoir or journalism, all of it—the various fragments you mention--can just be tossed into the pot and brought to a boil. If the approach is systematic at all, it’s a very weird kind of system. Does that make any sense? I have to admit that despite being an adult, and supposedly smarter, I don’t really understand the most important things about my childhood any more than I did as a kid! Maybe I understand them less. I’d be interested in hearing how you think memory functions in your work. Also, I wonder if you have any thoughts about how your scholarly interests relate (if they do) to your poetic interests. I know that as a PhD student in English, you have a particular interest in how physical environments influence literature. Do you feel like this is an interest that you pursue in two different and separate arenas, or do the scholarship and the poetry feed off each other in some way? CP: I used to try to write poems about childhood, and they never felt right. I never trusted my memory (then again, I still don’t trust my memory), and then I was never sure why I was remembering the things I was remembering. I used to write all these poems about green beans in my father’s vegetable garden, and I began to wonder if, apart from showcasing the delight that describing green beans brought me, the poems did anything. I started asking myself, “So what?” And I didn’t have a really good answer to the question. Furthermore, I didn’t have a really good reason to keep searching for an answer, at least not in poems about green beans. I think the double remove you mention is an important one, at least for writing. For you it’s a remove of time and place, it seems: you are doubly disoriented, which allows you to reorient yourself, though poetry. (Am I being presumptuous?) I think my writing benefits from something of a time and space remove as well. You asked me if I can write about Wyoming when I am in Wyoming. I wrote poems about Wyoming when I was at the Ucross Foundation (in Ucross, WY) this past summer, but it’s hard to count that as being “in Wyoming.” I think of residencies as desert islands with desks and magically-appearing food. In the end, I suspect that it is easier for me to write about Wyoming when I am not in Wyoming. In the city, my mind does not get overly caught up in the immediate effects and minutiae of the landscape (what it looks like at the particular time that I happen to be writing, how it is changing); instead, I can access the landscape through my mind and, perhaps most importantly, through what I happen to be reading at the time. Wyoming gets filtered through thought and language before it finds its way into my poems. I think of you as an academic, because you teach. Do you think of yourself that way? Are your teaching and poetry writing related, or even dependant on each other? I know you are currently teaching literature classes and poetry workshops to undergraduates and to graduates at Hollins College. Do you teach works of literature that have influenced you? Does teaching change the way you write? Do you find (as I do) that your writing is patterned in what you are reading, or do the patterns of your poems come from different places? Maybe you’d like to talk about the poems you are writing now? AB: The teaching is hard work but also a lot of fun. I think that being somewhat intimately involved in the work of other writers forces me to be open and responsive to practices and possibilities I might otherwise be closed to, which is probably a good thing for my own writing. It also requires me to constantly exercise the critical muscles. I feel like I’ve learned a lot of things about writing from my students. I do like to assign and teach my favorite works, though now and then I’ve had this experience where I get all effusive in class about some poem or story I love which others don’t like at all or actively hate! Probably not an experience you can only have in a classroom. One of the things that has impressed me so much about the poems in Field Folly Snow is how you manage to not sacrifice the immediacy of bodily, visceral experience in order to be so attentive to where your responses are coming from and their broader implications. I think that what you’ve said about the connections between your work and your scholarly interests helps to explain the numerous levels—perceptual and intellectual—on display in your poems. The work is very smart, for lack of a better word, very open and receptive to so many kinds of possibilities. As for being an academic, I don’t see how I could call myself anything else. Based on my work experiences, I’m either an academic, a waiter, or a rail and fence-post splitter. And since I haven’t served dinner to a customer or split a rail for years now, I must be an academic. But to relate this to writing and try to make some general point about it (though at the risk of stating the obvious) I’d say that one good thing about being an academic, a scholar, a teacher, is that at it formalizes the need for a close and sustained attention to texts and ideas. Which isn’t to say that it’s the only place where that happens or even the best place for everyone. My newer work comes from a much different place than the earlier poems. At least the earlier poems in the New Guinea book, in that they’re not so locked-in to a particular phase of my own life. What I’d like to do is take whatever lessons I learned from writing those poems and apply them more broadly—to subjects more wide-ranging and less caught up in autobiography. For me, it feels liberating to have that first project, which was certainly a project, out of the way. Time to move on. What’s your feeling about this? What are you doing now, and what continuity do you feel between what you’ve already written and what you’re writing now? CP: It’s interesting that you used “locked-in” to describe your poetic attention in Mission Work. Every book of poetry, I’d wager, has a similar intensity of focus. Before I read your book, I wondered how you would create a poetic arc within the constraints of time (in your case, childhood) and place. As I read Mission Work, I never felt “locked-in”; rather, I found myself having to recalibrate my sense of what the poems were “about” (I use the scare quotes because it is so maddening to ever try to explain what a poem is about). Your poems challenge the reader to not only to see a place she’s never seen but also to see it from a multiplicity of perspectives. Time, in these poems, is not always linear; it is not always easy to draw a line between cause and effect. The book (intentionally, I think) unsettles each explanation the reader might bring to an individual poem and to those relationships that the poems negotiate. what you sought here, so far from home. As readers, I think we hope to lose ourselves in books. We forget what we are supposed to be doing; our world becomes the world of the text. When we are done reading, we return to “real life” and find it laced with traces of what we’ve read. We want (or maybe I want) poems to resonate, and I think that yours do. I, like you, look forward to working on a new project. These days I am writing poems when I can. They are still very much invested in the natural world, and I am still (I must admit) writing poems about fields and folly and snow. However, I find that my forms and content are shifting, microscopically, in their attention toward a subject that is (as of yet) nebulous. I don’t mean to be coy. I imagine that it will take me some years to produce enough poems for another collection, and I don’t anticipate knowing what that book will look like until the last minute. As a child, I was known for taking a long time to “get used to things,” and I suppose my writing is no different. My writing (as I mentioned earlier) is patterned in my reading. Lately I find myself reading about grass, in two books in particular: Agnes Chase’s First Book of Grasses and Field Guide to the Grasses, Sedges, and Rushes of the U.S. I have been also reading some Jonathan Edwards and Revelations of Divine Love by Julian of Norwich. I like the idea of looking in nature for signs of the divine, and I have been wondering lately what it would be like, in today’s world, to will oneself to see the supernatural in something small, like a blade of grass (or as Jonathan Edwards did, in the actions of a spider). Recently I also fell in love with Dorothy Wordsworth’s Alfoxden Journal, maybe because Dorothy writes about grass. All of this makes it seem like I am reading and writing all the time, which (sadly) I’m not. What are you reading now? What is it suggesting to you and your poems? AB: Thanks for your comments. That’s a very sympathetic reading of how I tried to put the poems together. And not surprisingly at all (to me), your characterizations of them are extremely close to how I’d describe the poems in Field Folly Snow. Poems which I think transcend any kind of easy paraphrase based on their supposed subject matter and which constantly shift and redefine themselves, and which, like so many good poems, seem to not only create their own space—a place where we never could have expected to go--but in some ways create their own readers. By which I mean that we’re forced to constantly reexamine our own responses and reorient ourselves to them while we read. If I’d heard that the book was a collection of poems set in Wyoming, I might think we were talking about a book of cowboy poetry or simple hymns to the beauty of the natural world! I guess what I’m trying to say is that the book is much more complex and richer than I think we have any right to expect. It’s funny that you mention Dorothy Wordworth’s journals, which I just finished teaching in a class at Hollins called “The Artist’s Journal.” For that class, we’ve been reading a lot of diaries, notebooks, and sketches by poets and others. One thing that’s struck me about them, beside their content, is the degree to which the traits we associate with such writing—ellipsis, fragmentation, the motions of the mind as it moves in fits and starts—typify so much contemporary work which is presented to us as “finished.” It’s been very interesting for me, and I’ve been reading a lot of such works lately beyond those that ended up on the syllabus. Many times, as when reading Roethke’s notebooks, I’ve felt that the material actually rivals some of the finished poems. I guess I’m becoming more interested—at least in a systematic way-- than I already was in how certain kinds of incompleteness, of uncertainty and hesitation, actually open poems up instead of closing them down and restricting how they might be read. And how that might be done without sacrificing precision in language or form, something, which has long fascinated me in Roethke, someone whose work I’m always going back to. Or which I think I see in Tomas Tranströmer, who I’ve been reading more recently. I’d be on shaky ground, I suppose, to say that his language is “precise” when I’m only reading it in translation. But even in translation, it seems to exhibit these simultaneous qualities of precision and openness that I want to learn more about. Thanks for having this conversation with me! It’s been a lot of fun. Since I started, I’ll let you have the last word. We’ve talked about your book, but how if at all has the experience of publishing it altered your sense of yourself as a writer? Are you affected at all by knowing that you now have an audience? CP: I love what you said about uncertainty and incompleteness, about how those moments where the text falters might be doorways to something larger, revelatory even, in the experience of both the reader and the writer. A favorite professor of mine recently spoke in class about the ways in which reading a text as incomplete can open up exciting interpretive possibilities for the reader. I love the idea of teaching a class called “The Artist’s Journal.” Although I haven’t read many of them, I have a fondness for artists’ notebooks and journals. They contain errors, repetition, variations on themes, and so many moments where the writer is obviously, pointedly in a dialogue with him- or herself. I read Robert Frost’s Notebooks this past summer and was surprised by how engrossing they are. His notes are sometimes strange and sometimes luminous, and I was so struck by some of the lines that I used them for poem titles in my collection. The experience of publishing is something I looked forward to in the abstract, before I knew my book would be published. I never thought publication would change my life, or the way I write, or even the way I think about writing – and I think it hasn’t. The most rewarding part of this experience has been hearing feedback on the book from family, friends, and teachers. Are they my audience? I hope so. Are there other people who might be my audience? I look forward to meeting them. Or perhaps I should say: I look forward to having them meet my poems. In closing, I am so glad to have met your poems. Thank you for talking about them with me.